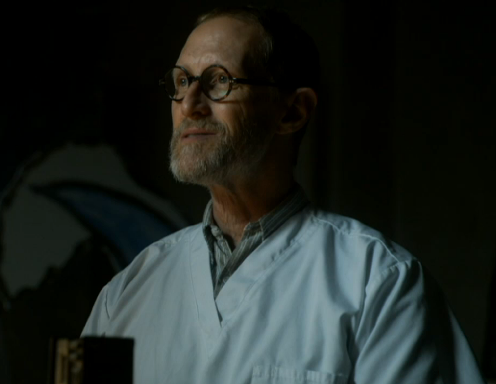 Last Monday, Fox aired Gotham’s midseason premiere, "Rogues’ Gallery". In this episode, we were introduced to some new characters, as well as given a glimpse into Jim Gordon’s new job at Arkham Asylum. Without further ado, let’s delve in! Spoilers ahead. Last we saw of Fish, she was about to make her biggest move against Falcone by having Butch reach out to Saviano and Turski — two of Falcone’s men who were recently angered by Falcone's raising the tariff. Fish talks to Saviano at her club, and is disappointed to find out he plans to take over from Falcone should anything ever happen to the Don. She tries to convince him she’s a better person for the job. Fish says they need to deal with Saviano before making any further moves against Falcone. Butch offers to talk to him, since the two of them are old friends. Fish becomes suspicious and wonders if perhaps Butch is thinking of turning on her and joining Saviano instead, which he denies. Saviano seems to have a similar idea. When the two are alone together and reminiscing, Saviano offers Butch to come over to his side, claiming Fish is doomed. Butch asks to think it over. It looks like he really is about to betray Fish, when he meets with Saviano again and accepts his offer. However, his acceptance seems to be a ruse as, after making one last confession to Saviano about a small slight he made against him years ago, Butch kills his old friend. Meanwhile, Oswald has managed to land himself in jail. It turns out he had been raising taxes on fishermen without Maroni’s permission. Oswald wasn’t at all afraid when the fishermen called the cops, since he and Maroni have the police force completely in their hands. But this time the police actually arrested him. Oswald, assuming Maroni doesn’t know he’s in jail, asks Harvey if he can make a phone call, which Harvey denies. It turns out, however, that Maroni was completely aware of Oswald’s being jailed, and actually arranged it himself. He wanted to humiliate him and teach him a lesson after doing things without permission. Maroni lets Oswald out of jail, but also tells him to remember his place. Barbara tells Montoya she doesn’t need to be jealous of Jim anymore because she’s over him, and seems quite satisfied to stay with Montoya now. Montoya, however, apparently doesn’t feel the same way. She tells Barbara that their getting back together was a mistake because they’re toxic together, and it’s only aggravating Barbara’s drug addiction. Barbara gets angry and Montoya leaves so she can calm down. Meanwhile, Cat finds Ivy sick in an alleyway. To help her recover, she takes Ivy to the apartment Jim and Barbara used to share, which seems to have been abandoned for some time. Now that she’s broken up with Montoya, Barbara calls the apartment in the hopes Jim is there, but Ivy answers the phone. To entertain herself, Ivy pretends to be Jim’s girlfriend. Barbara believes it and angrily hangs up. Over at Arkham Asylum, Jim Gordon’s new boss, Dr. Lang, blames him for every event that goes wrong, the latest of which is Shakespearean play the inmates were putting on, which turned into an attack. While helping take care of the attacked man, Jim meets Dr. Leslie Thompkins, who normally works in the female ward but comes over when they’re shorthanded. She says she’s heard a lot about Jim, and she admires him for not quitting, as the Mayor is trying to drive him to do. Jim finds an inmate braindead in his cell. Leslie looks him over and concludes he was a victim of a crude, invasive electroshock therapy where too much voltage was used. When Dr. Lang finds out, he blames Jim once again. Jim says it’s impossible to keep things from going wrong, what with the asylum being unsafe and understaffed, but these explanations don’t impress his boss. Jim wants to call the GCPD to investigate the incident, but Dr. Lang insists it’s an in-house medical issue and tells Jim to find out which inmate did it. Leslie says that whoever performed the electroshock therapy would need basic knowledge of human anatomy, a circuit board and wiring, and door keys. The inmates’ cells are searched, but no keys are found. Jim asks a guard if any keys have been stolen, and the guard admits his were taken during the Shakespeare play scuffle. With the help of Nurse Duncan, Jim questions the inmates about who might have stolen them, but this leads nowhere. Soon, another patient falls victim to the crude electroshock therapy. This time, the patient is not braindead, but can only speak in lines from the Shakespeare play. Jim believes the culprit is a member of the staff rather than a patient, and tells Leslie she should go back to the women’s ward to avoid the coming drama. Leslie wonders why Jim would want her to leave during an investigation of the staff, since she’s staff as well, but Jim tells her he doesn’t believe she’s guilty. Jim calls the GCPD without Dr. Lang’s permission. 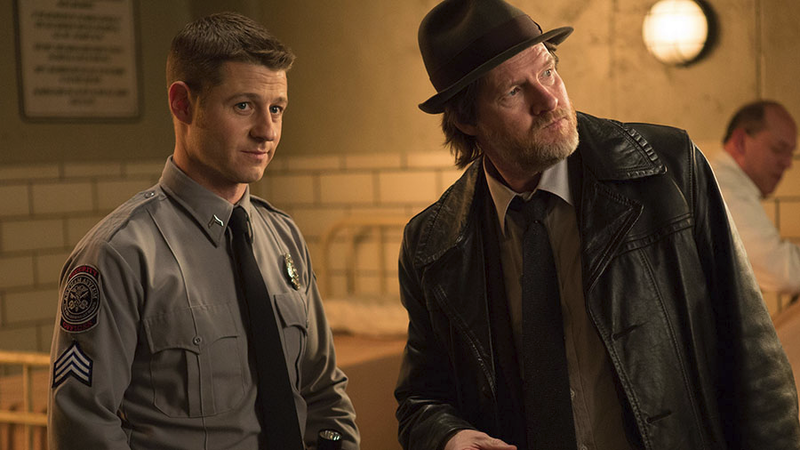 Harvey Bullock rushes over, quite happy to see his old partner again. Dr. Lang tells Harvey that the GCPD isn’t needed in this matter, but Harvey insists Jim did the right thing and declares an official investigation. Harvey also says that Dr. Lang is acting very suspicious in trying to keep the police out of it; and since he also has the know-how to commit the crime, he’ll be brought in for questioning. At the station, Dr. Lang admits to Harvey he has secrets, but refuses to speak about them, saying they have nothing to do with case at hand. He also says he can’t think of any staff members who would do this. But Dr. Lang then gives Harvey a very valuable piece of information — Nurse Duncan isn’t actually a member of the staff, but a patient who pretends to be a nurse. Nurse Duncan, meanwhile, is looking for a way to lure Jim into her lair in the basement. She gets her chance when Jim, finding the files he’s looking through are incomplete, wants to search the basement to look for more files. Not knowing Nurse Duncan is actually a patient, he follows her down there. 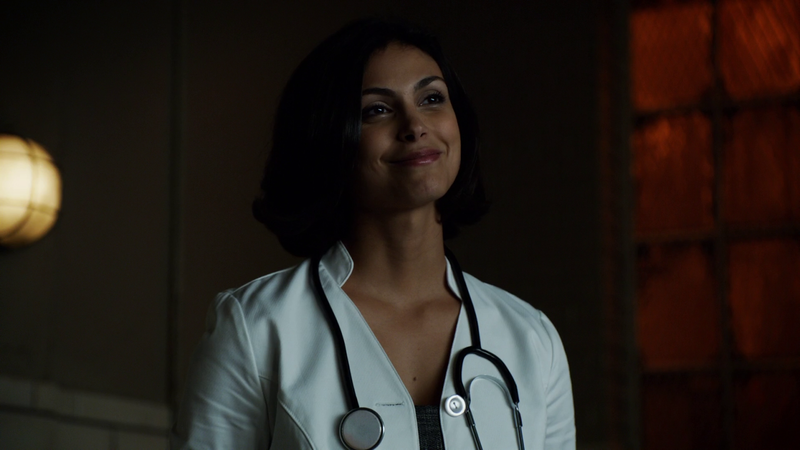 But when the two of them are caught at the basement entrance by Dr. Leslie Thompkins, Nurse Duncan flees. Running through the Asylum, she lets all the other patients loose, but ends up getting trampled in the stampede of freed inmates. Leslie gets herself and Jim outside the Asylum gate, and locks it before the patients can get out. An examination of Nurse Duncan’s body reveals she had gone through the crude electroshock therapy as well. Which means she was just another victim, not the culprit. They discover the identity of the true culprit when an inmate, Jack Gruber, kills a guard and Dr. Lang, escaping the asylum. He leaves a note for Jim, explaining that the only reason he stayed at the asylum so long was so he could practice his electroshock therapy on the patients there. Now that he’s had sufficient practice, he’s moving on to the outside world. At the end of the episode, Jim comes to the apartment he and Barbara once shared. He sees the dishes and blankets left by Cat and Ivy, and assumes Barbara has been there. I have to admit that, as much as I love this show, "Rogues' Gallery" was not it’s most impressive episode. Besides the strange absence of many important characters (Bruce, Alfred, Eddie), the writing and acting was off in several places. What’s more, many elements were left unexplained, and the story had a habit of stretching the suspension of disbelief. Why did everyone treat Nurse Duncan like real staff when she was just a patient? Why didn’t anyone tell Jim who she was? How can Barbara actually believe it was a girlfriend of Jim's on the phone, when the voice was so obviously a child’s? And then there’s the small controversy over the handling of disabilities on the show. Is it really a good idea to use mental illness for comedy, as this episode does with its array of Arkham Asylum patients? Another thing I felt was unexplained was Oswald’s sudden decision to start calling himself the Penguin. Oswald has been fighting that name during the entire course of the show, and I’ve been wondering what would finally convince him to embrace it. Now that he has, I still don’t know. He seems to have changed his mind about the title just out of the blue. I’m also not overly impressed with Leslie yet. She hasn’t done anything to really interest me in her character; though she has only just joined the show, so that may change. I’m not a fan of how she’s written or acted so far. And I have a feeling her purpose on the show will be similar to Barbara’s — adding romance and unnecessary problems to Jim’s life. Jim has already taken to her far too quickly. I’m not looking forward to the Leslie/Jim/Barbara love triangle that will inevitably be added to the already existing Jim/Barbara/Montoya drama. I wish the writers would realize that Jim’s love life with poorly written female characters is the least interesting aspect of this show. However, despite not being a fan of this episode overall, there were still some parts I enjoyed. The biggest of which was Harvey Bullock swooping in to save the day and put Dr. Lang in his place. I really love how his friendship with Jim continues to grow, even though Jim no longer works at the GCPD. Another thing that interested me was Butch’s loyalty to Fish. It genuinely looked like he was going to betray her, but it turns out he’ll kill even an old friend of his in order to get him out of Fish’s way. It makes me wonder where such intense loyalty comes from. Why is Butch so confident Fish will make it to the top? And why is he so willing to risk everything to help her get there? Even in the pilot episode, when Fish found out she’d been betrayed by someone in her employ, she was absolutely sure it couldn’t be Butch. How was she so sure? It’ll be interesting to see if the writers delve into this further. In any case, I’m glad Butch is getting some character development, rather than just being kept vaguely as “Fish’s right-hand man”. It was also interesting to see some animosity between Maroni and Oswald, though raising taxes on fishermen is kind of a random issue for them to clash over. Maroni seems very satisfied with himself after putting Oswald in his place, but he’s going to deeply regret humiliating him. Don Maroni is not nearly as powerful as he or others think he is. He’s ruthless and daring; but not clever, and too often takes things at face value. He underestimates Oswald, because Oswald looks like a weakling on the outside. And that underestimation will cost him in the end. I wouldn’t be surprised if Oswald has already moved arranging Maroni’s death up on his to-do list. Though “Rogues’ Gallery” was less than impressive, the show’s next two episodes, “What the Little Bird Told Him” and “Welcome Back, Jim Gordon” (which air on January 19th and 26th, respectively), look like they will more than make up for it. Jack Gruber will be back, revealing himself as the Batman villain known as “The Electrocutioner”. And from some sneak peeks I’ve seen, it looks like he’ll have some very unexpected victims. I’ve also been informed that some interesting events will unfold between Fish and Oswald soon. And the next two weeks will see the return of characters such as Victor Zsasz, Gertrud Kapelput, and Kristin Kringle. In a recent article, Gotham showunners revealed we would soon see a side of Eddie we’ve never seen before, so that may also happen within the next couple weeks. So it looks like Gotham fans have some exciting things in store. And I will see you after the next episode airs next week on Fox!